First of a three-part cover story article exploring how FMs can adapt their workplaces to an increasingly mobile workforce. Thirty years ago, it was somewhat of a fantasy that businesses would one day migrate toward a “paperless office.” Much has changed since then. Technology has evolved in ways that have completely altered the manner in which people work today. With the introduction of networking, the Internet, mobile phones, SMS text messaging, and Wi-Fi, the ways — and more importantly the places — that people work are seemingly unlimited. Technological changes have advanced how we work so rapidly that it has been nearly impossible to adapt our work environments to keep up with the changes. Today, business leaders are closely examining how to best leverage all this technology to maximize the productivity of their employees. As the Baby Boom generation begins to exit the workforce, those workers are being replaced by younger, more technology-savvy employees who have been raised to effectively communicate in a highly mobile way. They are accustomed to managing tasks and functions wherever they are, and they are comfortable navigating even the most complicated activities through their phones or tablets. This simple reality has motivated many businesses, which were previously reluctant or resistant to considering a mobile work policy, to instead embrace the concept. The biggest challenge most companies face in getting ready for a mobile work strategy lies in figuring out how the workplace is currently utilized. A growing number of businesses provide tracking technologies that enable facility managers to more accurately document how their work environments are occupied throughout the work day. By developing a clear understanding of the vacancy rate of individual work spaces, and the demand on meeting areas, facility managers can create a more accurate snapshot of workplace utilization. That snapshot shows what percent of staff is already working in environments that are not traditional workstations or offices. Today, numerous computer-aided facility management (CAFM) and data tracking companies offer sensor-based software systems for monitoring the time and duration that spaces are occupied. These systems can help form a critical baseline of information, but they have limitations. Other suppliers have taken an even deeper dive on utilization by developing software that not only tracks workplace usage, but also leverages real time user-supplied data to document the quality and functionality of a particular room. This information helps facility managers understand which types of spaces are in greatest demand — and more importantly, why. A careful study of how the current work environment is utilized can show how ready a business is for deploying a mobile work environment. Monitoring both the frequency and quality of space use helps to determine the ratio of workspaces to employees that should be planned for a mobile work environment. Identifying how many unassigned seats should be shared is the ultimate goal. 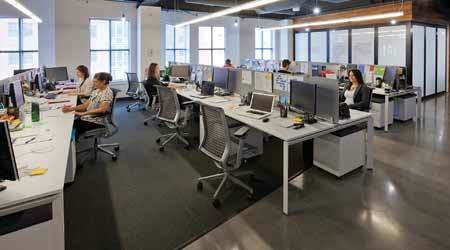 A conservative mobile work ratio would be 1 to 2 — one workspace for every two employees. A more aggressive goal for mobility, where 70 to 90 percent of staff are mobile, would lean toward a 1 to 4 or 1 to 5 ratio. For example, many cloud-based technology companies are carefully studying their utilization rates and drawing the conclusion that a formal mobile work strategy is not only logical, but in sync with their missions and corporate philosophies. Given that so much of their work product is stored remotely, they view their mobile work strategy as one that enables them to optimize their real estate portfolio, expand talent recruitment, and align with their growth trajectory. The two most common business drivers for considering a mobile work program are real estate and human resources. On the real estate end, if business operations can be achieved efficiently and productively in a smaller footprint, the cost savings is an obvious inducement. From the HR perspective, companies that are committed to a work environment that supports and promotes a higher degree of work-life balance are very appealing to job candidates. As more work functions and activities become “mobile friendly,” it is easier to appreciate why both management and staff alike would embrace a remote work arrangement. On the business level, it expands their ability to recruit and retain top talent that may not be geographically within commuting distance. On the employee level, especially those working within global corporations with locations in various time zones, it enables them to work productively the hours that are most effective for their functions. Most office environments today are not as ready for a mobile work strategy as the younger tech-sophisticated talent they are recruiting. 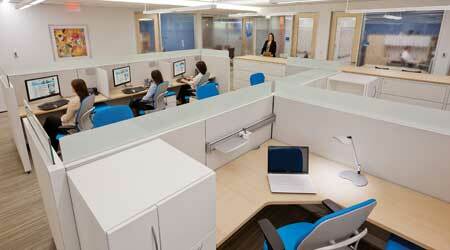 Many companies still maintain a workplace design that is now a 50-year-old paradigm of cubes and private offices. This layout, though functional, does not support a more agile and collaborative way of working. 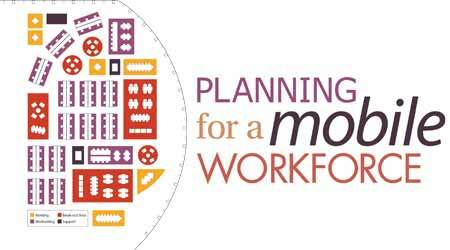 For a workplace to support a mobile workforce, it must reflect a certain innovative vitality. The environment should foster and encourage a fresh way of thinking, and provide a variety of space options that cater to employees’ different work styles. The degree of change to the work environment relates directly, however, to the corporate commitment to mobility. A business that is willing to launch a company-wide mobile work policy has a very different challenge than a company that has defined only a small percentage of the workforce as eligible for remote work.